Mothers against decapentaplegic homolog 7 or SMAD7 is a protein that in humans is encoded by the SMAD7 gene. SMAD7 is a protein that, as its name describes, is a homolog of the Drosophila gene: "Mothers against decapentaplegic". It belongs to the SMAD family of proteins, which belong to the TGFβ superfamily of ligands. Like many other TGFβ family members, SMAD7 is involved in cell signalling. 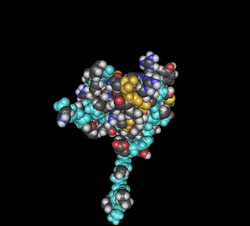 It is a TGFβ type 1 receptor antagonist. It blocks TGFβ1 and activin associating with the receptor, blocking access to SMAD2. It is an inhibitory SMAD (I-SMAD) and is enhanced by SMURF2. Smad proteins contain two conserved domains. The Mad Homology domain 1 (MH1 domain) is at the N-terminal and the Mad Homology domain 2 (MH2 domain) is at the C-terminal. Between them there is a linker region which is full of regulatory sites. The MH1 domain has DNA binding activity while the MH2 domain has transcriptional activity. The linker region contains important regulatory peptide motifs including potential phosphorylation sites for mitogen-activated protein kinases(MAPKs), Erk-family MAP kinases, the Ca2+ /calmodulin-dependent protein kinase II (CamKII) and protein kinase C (PKC). Smad7 does not have the MH1 domain. A proline-tyrosine (PY) motif presents at its linker region enables its interaction with the WW domains of the E3 ubiquitin ligase, the Smad ubiquitination-related factors (Smurf2). It resides predominantly in the nucleus at basal state and translocates to the cytoplasm upon TGF-β stimulation. SMAD7 inhibits TGF-β signaling by preventing formation of Smad2/Smad4 complexes which initiate the TGF-β signaling. It interacts with activated TGF-β type I receptor therefore block the association, phosphorylation and activation of Smad2. By occupying type I receptors for Activin and bone morphogenetic protein (BMP), it also plays a role in negative feedback of these pathways. Upon TGF- β treatment, Smad7 binds to discrete regions of Pellino-1 via distinct regions of the Smad MH2 domains. The interaction blocks the formation of the IRAK1-mediated IL-1R/TLR signaling complex therefore abrogates NF-κB activity, which subsequently causes reduced expression of pro-inflammatory genes. While Smad7 is induced by TGF-β, it is also induced by other stimuli, such as epidermal growth factor (EGF), interferon-γ and tumor necrosis factor (TNF)-α. Therefore, it provides a cross-talk between TGF-β signaling and other cellular signaling pathways. A mutation located in SMAD7 gene is a cause of susceptibility to colorectal cancer (CRC) type 3. Perturbation of Smad7 and suppression of TGF-β signaling was found to be evolved in CRC. Case control studies and meta-analysis in Asian and European populations also provided evidence that this mutation is associated with colorectal cancer risk. TGF-β is one of the important growth factors in pancreatic cancer. By controlling the TGF-β pathway, smad7 is believed to be related to this disease. Some previous study showed over-expression of Smad7 in pancreatic cells but there was a recent study showed a low Smad7 expression. The role of Smad7 in pancreatic cancer is still controversial. Over-expression or constitutive activation of epidermal growth factor receptor (EGFR) can promote tumor processes. EGF-induced MMP-9 expression enhances tumor invasion and metastasis in some kinds of tumor cells such as breast cancer and ovarian cancer. Smad7 exerts an inhibitory effect on the EGF signaling pathway. Therefore, it may play a role in prevention of cancer metastasis. SMAD7 signaling has been studied in a recent Celgene Phase II trial of GED-0301, which interacts with the SMAD7 pathway. This drug was studied in patients with Crohn's disease. ↑ "Diseases that are genetically associated with SMAD7 view/edit references on wikidata". ↑ Shi Y, Hata A, Lo RS, Massagué J, Pavletich NP (July 1997). "A structural basis for mutational inactivation of the tumour suppressor Smad4". Nature. 388 (6637): 87–93. doi:10.1038/40431. PMID 9214508. ↑ Kretzschmar M, Doody J, Massagué J (October 1997). "Opposing BMP and EGF signalling pathways converge on the TGF-beta family mediator Smad1". Nature. 389 (6651): 618–22. doi:10.1038/39348. PMID 9335504. ↑ Wicks SJ, Lui S, Abdel-Wahab N, Mason RM, Chantry A (November 2000). "Inactivation of smad-transforming growth factor beta signaling by Ca(2+)-calmodulin-dependent protein kinase II". Mol. Cell. Biol. 20 (21): 8103–11. doi:10.1128/MCB.20.21.8103-8111.2000. PMC 86420 . PMID 11027280. ↑ Yakymovych I, Ten Dijke P, Heldin CH, Souchelnytskyi S (March 2001). "Regulation of Smad signaling by protein kinase C". FASEB J. 15 (3): 553–5. doi:10.1096/fj.00-0474fje. PMID 11259364. ↑ Itóh S, Landström M, Hermansson A, Itoh F, Heldin CH, Heldin NE, ten Dijke P (October 1998). "Transforming growth factor beta1 induces nuclear export of inhibitory Smad7". J. Biol. Chem. 273 (44): 29195–201. doi:10.1074/jbc.273.44.29195. PMID 9786930. 1 2 Hayashi H, Abdollah S, Qiu Y, Cai J, Xu YY, Grinnell BW, Richardson MA, Topper JN, Gimbrone MA, Wrana JL, Falb D (June 1997). "The MAD-related protein Smad7 associates with the TGFbeta receptor and functions as an antagonist of TGFbeta signaling". Cell. 89 (7): 1165–73. doi:10.1016/S0092-8674(00)80303-7. PMID 9215638. ↑ Ishisaki A, Yamato K, Hashimoto S, Nakao A, Tamaki K, Nonaka K, ten Dijke P, Sugino H, Nishihara T (May 1999). "Differential inhibition of Smad6 and Smad7 on bone morphogenetic protein- and activin-mediated growth arrest and apoptosis in B cells". J. Biol. Chem. 274 (19): 13637–42. doi:10.1074/jbc.274.19.13637. PMID 10224135. ↑ Nakao A, Afrakhte M, Morén A, Nakayama T, Christian JL, Heuchel R, Itoh S, Kawabata M, Heldin NE, Heldin CH, ten Dijke P (October 1997). "Identification of Smad7, a TGFbeta-inducible antagonist of TGF-β signalling". Nature. 389 (6651): 631–5. doi:10.1038/39369. PMID 9335507. ↑ Lee YS, Kim JH, Kim ST, Kwon JY, Hong S, Kim SJ, Park SH (March 2010). "Smad7 and Smad6 bind to discrete regions of Pellino-1 via their MH2 domains to mediate TGF-beta1-induced negative regulation of IL-1R/TLR signaling". Biochem. Biophys. Res. Commun. 393 (4): 836–43. doi:10.1016/j.bbrc.2010.02.094. PMID 20171181. ↑ Bitzer M, von Gersdorff G, Liang D, Dominguez-Rosales A, Beg AA, Rojkind M, Böttinger EP (January 2000). "A mechanism of suppression of TGF-beta/SMAD signaling by NF-kappa B/RelA". Genes Dev. 14 (2): 187–97. doi:10.1101/gad.14.2.187 (inactive 2015-01-01). PMC 316349 . PMID 10652273. ↑ Halder SK, Rachakonda G, Deane NG, Datta PK (September 2008). "Smad7 induces hepatic metastasis in colorectal cancer". Br. J. Cancer. 99 (6): 957–65. doi:10.1038/sj.bjc.6604562. PMC 2538763 . PMID 18781153. ↑ Song Q, Zhu B, Hu W, Cheng L, Gong H, Xu B, Zheng X, Zou L, Zhong R, Duan S, Chen W, Rui R, Wu J, Miao X (2012). Peterlongo P, ed. "A common SMAD7 variant is associated with risk of colorectal cancer: evidence from a case-control study and a meta-analysis". PLoS ONE. 7 (3): e33318. doi:10.1371/journal.pone.0033318. PMC 3310071 . PMID 22457752. ↑ Kleeff J, Ishiwata T, Maruyama H, Friess H, Truong P, Büchler MW, Falb D, Korc M (September 1999). "The TGF-beta signaling inhibitor Smad7 enhances tumorigenicity in pancreatic cancer". Oncogene. 18 (39): 5363–72. doi:10.1038/sj.onc.1202909. PMID 10498890. ↑ Guo J, Kleeff J, Zhao Y, Li J, Giese T, Esposito I, Büchler MW, Korc M, Friess H (May 2006). "Yes-associated protein (YAP65) in relation to Smad7 expression in human pancreatic ductal adenocarcinoma". Int. J. Mol. Med. 17 (5): 761–7. doi:10.3892/ijmm.17.5.761. PMID 16596258. ↑ Arnold NB, Ketterer K, Kleeff J, Friess H, Büchler MW, Korc M (May 2004). "Thioredoxin is downstream of Smad7 in a pathway that promotes growth and suppresses cisplatin-induced apoptosis in pancreatic cancer". Cancer Res. 64 (10): 3599–606. doi:10.1158/0008-5472.CAN-03-2999. PMID 15150118. ↑ Singh P, Wig JD, Srinivasan R (2011). "The Smad family and its role in pancreatic cancer". Indian J Cancer. 48 (3): 351–60. doi:10.4103/0019-509X.84939. PMID 21921337. ↑ Salomon DS, Brandt R, Ciardiello F, Normanno N (July 1995). "Epidermal growth factor-related peptides and their receptors in human malignancies". Crit. Rev. Oncol. Hematol. 19 (3): 183–232. doi:10.1016/1040-8428(94)00144-I. PMID 7612182. ↑ Burgess AW, Cho HS, Eigenbrot C, Ferguson KM, Garrett TP, Leahy DJ, Lemmon MA, Sliwkowski MX, Ward CW, Yokoyama S (September 2003). "An open-and-shut case? Recent insights into the activation of EGF/ErbB receptors". Mol. Cell. 12 (3): 541–52. doi:10.1016/S1097-2765(03)00350-2. PMID 14527402. ↑ Kim S, Choi JH, Lim HI, Lee SK, Kim WW, Cho S, Kim JS, Kim JH, Choe JH, Nam SJ, Lee JE, Yang JH (June 2009). "EGF-induced MMP-9 expression is mediated by the JAK3/ERK pathway, but not by the JAK3/STAT-3 pathway in a SKBR3 breast cancer cell line". Cell. Signal. 21 (6): 892–8. doi:10.1016/j.cellsig.2009.01.034. PMID 19385051. ↑ Ellerbroek SM, Hudson LG, Stack MS (October 1998). "Proteinase requirements of epidermal growth factor-induced ovarian cancer cell invasion". Int. J. Cancer. 78 (3): 331–7. doi:10.1002/(SICI)1097-0215(19981029)78:3<331::AID-IJC13>3.0.CO;2-9. PMID 9766568. ↑ Kim S, Han J, Lee SK, Koo M, Cho DH, Bae SY, Choi MY, Kim JS, Kim JH, Choe JH, Yang JH, Nam SJ, Lee JE (January 2012). "Smad7 acts as a negative regulator of the epidermal growth factor (EGF) signaling pathway in breast cancer cells". Cancer Lett. 314 (2): 147–54. doi:10.1016/j.canlet.2011.09.024. PMID 22033246. ↑ "Phase II Data for Celgene's Investigational Oral GED-0301 for Patients with Active Crohn's Disease Published in New England Journal of Medicine". Celgene. Celgene Corporation. Retrieved 2015-04-20. ↑ Edlund S, Lee SY, Grimsby S, Zhang S, Aspenström P, Heldin CH, Landström M (February 2005). "Interaction between Smad7 and beta-catenin: importance for transforming growth factor beta-induced apoptosis". Mol. Cell. Biol. 25 (4): 1475–88. doi:10.1128/MCB.25.4.1475-1488.2005. PMC 548008 . PMID 15684397. ↑ Edlund S, Bu S, Schuster N, Aspenström P, Heuchel R, Heldin NE, ten Dijke P, Heldin CH, Landström M (February 2003). "Transforming growth factor-beta1 (TGF-beta)-induced apoptosis of prostate cancer cells involves Smad7-dependent activation of p38 by TGF-beta-activated kinase 1 and mitogen-activated protein kinase kinase 3". Mol. Biol. Cell. 14 (2): 529–44. doi:10.1091/mbc.02-03-0037. PMC 149990 . PMID 12589052. 1 2 Koinuma D, Shinozaki M, Komuro A, Goto K, Saitoh M, Hanyu A, Ebina M, Nukiwa T, Miyazawa K, Imamura T, Miyazono K (December 2003). "Arkadia amplifies TGF-beta superfamily signalling through degradation of Smad7". EMBO J. 22 (24): 6458–70. doi:10.1093/emboj/cdg632. PMC 291827 . PMID 14657019. 1 2 3 Datta PK, Moses HL (May 2000). "STRAP and Smad7 synergize in the inhibition of transforming growth factor beta signaling". Mol. Cell. Biol. 20 (9): 3157–67. doi:10.1128/MCB.20.9.3157-3167.2000. PMC 85610 . PMID 10757800. ↑ Lebrun JJ, Takabe K, Chen Y, Vale W (January 1999). "Roles of pathway-specific and inhibitory Smads in activin receptor signaling". Mol. Endocrinol. 13 (1): 15–23. doi:10.1210/mend.13.1.0218. PMID 9892009. 1 2 Asano Y, Ihn H, Yamane K, Kubo M, Tamaki K (January 2004). "Impaired Smad7-Smurf-mediated negative regulation of TGF-beta signaling in scleroderma fibroblasts". J. Clin. Invest. 113 (2): 253–64. doi:10.1172/JCI16269. PMC 310747 . PMID 14722617. 1 2 Kavsak P, Rasmussen RK, Causing CG, Bonni S, Zhu H, Thomsen GH, Wrana JL (December 2000). "Smad7 binds to Smurf2 to form an E3 ubiquitin ligase that targets the TGF beta receptor for degradation". Mol. Cell. 6 (6): 1365–75. doi:10.1016/S1097-2765(00)00134-9. PMID 11163210. ↑ Lee YS, Han JM, Son SH, Choi JW, Jeon EJ, Bae SC, Park YI, Kim S (July 2008). "AIMP1/p43 downregulates TGF-beta signaling via stabilization of smurf2". Biochem. Biophys. Res. Commun. 371 (3): 395–400. doi:10.1016/j.bbrc.2008.04.099. PMID 18448069. ↑ Mochizuki T, Miyazaki H, Hara T, Furuya T, Imamura T, Watabe T, Miyazono K (July 2004). "Roles for the MH2 domain of Smad7 in the specific inhibition of transforming growth factor-beta superfamily signaling". J. Biol. Chem. 279 (30): 31568–74. doi:10.1074/jbc.M313977200. PMID 15148321. ↑ Ferrigno O, Lallemand F, Verrecchia F, L'Hoste S, Camonis J, Atfi A, Mauviel A (July 2002). "Yes-associated protein (YAP65) interacts with Smad7 and potentiates its inhibitory activity against TGF-beta/Smad signaling". Oncogene. 21 (32): 4879–84. doi:10.1038/sj.onc.1205623. PMID 12118366. Verschueren K, Huylebroeck D (1999). "Remarkable versatility of Smad proteins in the nucleus of transforming growth factor-beta activated cells". Cytokine Growth Factor Rev. 10 (3–4): 187–99. doi:10.1016/S1359-6101(99)00012-X. PMID 10647776. Miyazono K, ten Dijke P, Heldin CH (2000). "TGF-beta signaling by Smad proteins". Adv. Immunol. 75: 115–57. doi:10.1016/S0065-2776(00)75003-6. PMID 10879283. Hayashi H, Abdollah S, Qiu Y, Cai J, Xu YY, Grinnell BW, Richardson MA, Topper JN, Gimbrone MA, Wrana JL, Falb D (June 1997). "The MAD-related protein Smad7 associates with the TGFbeta receptor and functions as an antagonist of TGFbeta signaling". Cell. 89 (7): 1165–73. doi:10.1016/S0092-8674(00)80303-7. PMID 9215638. Röijer E, Morén A, ten Dijke P, Stenman G (1998). "Assignment1 of the Smad7 gene (MADH7) to human chromosome 18q21.1 by fluorescence in situ hybridization". Cytogenet. Cell Genet. 81 (3–4): 189–90. doi:10.1159/000015026. PMID 9730599. Denissova NG, Pouponnot C, Long J, He D, Liu F (June 2000). "Transforming growth factor beta -inducible independent binding of SMAD to the Smad7 promoter". Proc. Natl. Acad. Sci. U.S.A. 97 (12): 6397–402. doi:10.1073/pnas.090099297. PMC 18614 . PMID 10823886. Stopa M, Anhuf D, Terstegen L, Gatsios P, Gressner AM, Dooley S (September 2000). "Participation of Smad2, Smad3, and Smad4 in transforming growth factor beta (TGF-beta)-induced activation of Smad7. THE TGF-beta response element of the promoter requires functional Smad binding element and E-box sequences for transcriptional regulation". J. Biol. Chem. 275 (38): 29308–17. doi:10.1074/jbc.M003282200. PMID 10887185. Ebisawa T, Fukuchi M, Murakami G, Chiba T, Tanaka K, Imamura T, Miyazono K (April 2001). "Smurf1 interacts with transforming growth factor-beta type I receptor through Smad7 and induces receptor degradation". J. Biol. Chem. 276 (16): 12477–80. doi:10.1074/jbc.C100008200. PMID 11278251. Itoh F, Asao H, Sugamura K, Heldin CH, ten Dijke P, Itoh S (August 2001). "Promoting bone morphogenetic protein signaling through negative regulation of inhibitory Smads". EMBO J. 20 (15): 4132–42. doi:10.1093/emboj/20.15.4132. PMC 149146 . PMID 11483516.